The proper way to use Windows is to install it and configure it as Administrator, then setup a user account, and then log in as a user. However, many people never bother to create a user account, they just log in as Administrator each time they use Windows. Unfortunately, this also allows hackers to access your system as Administrators. Logged as Administrator, they can change system configurations and install viruses. This problem was solved with Windows Vista. 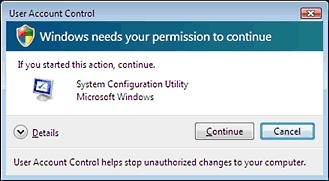 Vista always runs in Standard mode, which means that if you, anyone else, or anything, wants to change a system configuration or install software, the User Account Control dialog box appears requesting permission to make the change. • The appearance of the User Account Control dialog box depends upon your log in account. If you're logged in as Administrator, just click the [Continue] button to proceed. If you're logged in as a user, the User Account Control dialog box requires the name and password of an Administrator. Although the User Account Control protects your system from hackers, there are situations where it's just an annoyance, for example if you're not connected to the Internet, or if you're trying to troubleshoot your computer. Fortunately, you can easily turn the User Account Control off. 1. In Control Panel, in the User Accounts and Family Safety group, select User Accounts. Under Make changes to your user account, click on Turn User Account Control on or off. The User Account Control dialog box will appear requesting permission to make the change. 2. Login as Administrator and /or click the [Continue] button. 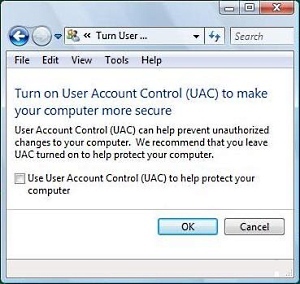 Under the message Turn on User Account Control (UAC) to make your computer more secure, uncheck the box next to  Use User Account Control (UAC) to help protect your computer. Then click on the [OK] button. As annoying as the User Account Control may be, it does provide an effective deterrent against hackers and viruses taking control of your computer. So when you've finished troubleshoot your computer, it's advisable to turn the User Account Control back on.